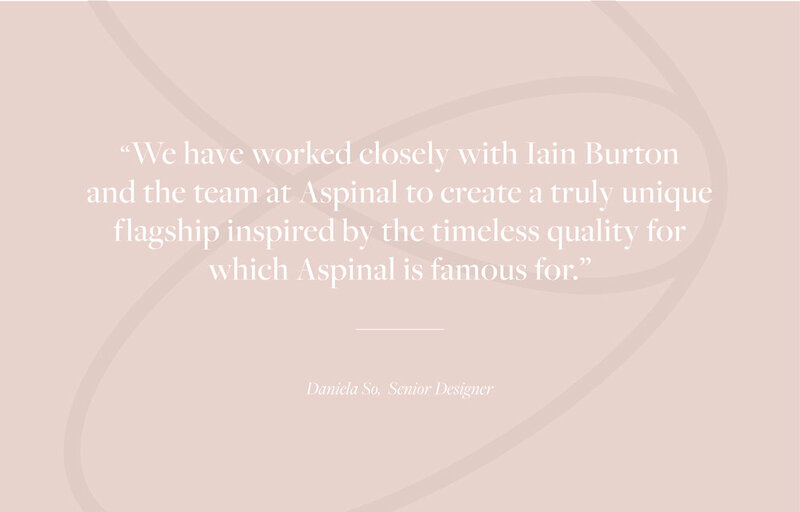 We continue our long-term partnership with Iain Burton and the team at Aspinal of London, one of the UK’s finest luxury leather goods companies. Aspinal is the home of quintessential English luxury leather goods. With celebrity ambassadors such as Michelle Dockery, Pippa Middleton, Mille Macktintosh and Donna Air the brand has gained noterity and built up a reputation around the world for producing the highest quality, elegant and refined products to enjoy for a lifetime. We welcome the spectacular show stopping new 3,475 square feet flagship to St James's Market, off Regents Street. The creative idea behind the store was the Home of Aspinal of London, a concept driven by rewarding the distinguished Aspinal customer with a much-deserved memorable experience. The store combines the understated warmth and richness of an English Country home with the contemporary elegance of a London townhouse. We weaved in the distinctive Aspinal signature elements throughout the design language. The store has spectacular, highly detailed signature elements, which highlight the integrity and craftsmanship of the Aspinal brand. Discover a statement brass screened entryway with a pattern inspired by the English countryside. A sweeping wooden carved staircase and full height ceiling in the foyer creates a strong first impression and a welcoming atmosphere with rich traditional details such as the paneling and fireplace. The spectacular Ladies' drawing room is sophisticated with feminine touches such as the elegant marble fireplace and attention to detail with the handpainted mouldings The gentlemen can relax in a tudor panelled warm and luxurious games room. Traditional touches such as the bespoke handcarved stone fireplace with the Aspinal engraved shield and antique furniture give it real character. A dramatic woodland animal frieze is illuminated around the entire room. The library/champagne bar houses Aspinal travel accessories and bags. There are pause points in almost every room where you can sit including at the stunning circular champagne bar inspired cash desk. The boudoir is comfortable, delicate and intimate with Aspinal feather handles on the furniture. The Aspinal members club is a flexible space that can be closed off for private functions with a balcony that overlooks the rest of the store. For Aspinal of London’s first flagship outside of London it was incredibly important to design and create the same magic and sense of engagement the brand showcases in its existing flagships into the Leeds Quarter store. To ensure this we worked with Aspinal of London through design intent drawings, design supervision right the way through to the final execution of the store and evaluation. We were excited to help grow the Aspinal of London brand and introduce the brand to the Leeds consumer. This included adapting some of the brands key signature in a more modern, contemporary context. One element of the store designed to be a key focal point was the theatre space in the centre of the store, which showcases the new collection of accessories in an engaging and visually rich way. We also worked with Aspinal of London to expand the colour palette of the brand instore, including new tones such as blush pink.